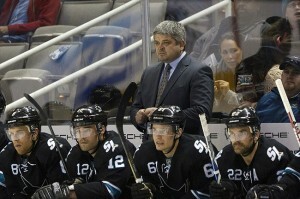 With a rough start to the season, Todd McLellan’s job may be in jeopardy. Through eighteen games the San Jose Sharks are just behind their 2013 season pace. That is not a good thing. Whether it’s the defensive problems, the constant rearranging of the roster or the coaching staff San Jose has yet to find its identity a month into the season. I would argue that the first 20-30 games of a season do not mean much in the long run but these early games can mean the difference in home ice advantage, making a poor trade or simply making a disastrous decision that could affect the organization for years to come. Panic is what destroys franchises and the more the Sharks lose the closer they will get to panic level. Sure firing Todd McLellan or Doug Wilson may be in the team’s best interest this season or next summer but then what? Will the Sharks try to trade away their assets? Will Thornton or Marleau finally ask to be traded after never wanting to leave? What about the fans, and the television deal that is siphoning money away from San Jose? Winning a Stanley Cup is important, in my eyes the most important aspect of the game, but if the Sharks begin to make drastic moves they could tear down the entire organization. It is true that many of the off-season rumblings upset people, including myself, but none were insane. Drew Remenda is a human being and as I have discussed before it is better not to have off-ice tension during live broadcasts (cough Ray Ratto.) The Ice Girls in San Jose also brought some hostility and it is a shame but it really doesn’t affect the on ice product. How many of you have really noticed these two things anyway? Jamie Baker has done a fine job in the booth and only the live audience get’s the “pleasure” of witnessing the ice girls. Over time things will change for better or for worse. The San Jose Sharks are an organization that started out breaking records in the worst way. They lost 71 games in the 1993 season and followed that up by beating the Detroit Red Wings in 1994. Over time the team became a playoff team, and eventually a playoff team that people took seriously. From here the Sharks simply need to take those final steps. Adam Burish hasn’t played well to start the season but neither has his line-mates. Perhaps the biggest thing that Sharks fans love to rant about is the Mike Brown and John Scott signings. Were they bad signings, sure there is no denying that but it is time to get over it especially when you consider all the factors involved. Ignore the fact that the Sharks did not sign another free agent and focus on who they did sign and what it will cost the Sharks. At this time Scott is on pace to play under 30 games and Brown is on pace to play under 10 games this season. Together they cost the team less than $2 million. All in all, they barely cost the team any cap space and will probably combine to play under 60 games this season. Can you make the argument that they are overpaid, yes, but while they may be overpaid by a few hundred thousand dollars there are other players in the NHL being overpaid by millions not thousands. San Jose still has a good deal of cap room too so neither contract is preventing them from signing someone like Dustin Penner or making a trade. While we are on the subject of fourth line players Adam Burish is someone who gets brought up as well. Burish was acquired in 2013 for the sole purpose of improving the Sharks abysmal penalty kill and taking face-offs after the team let go of Manny Malhotra and Scott Nichol. The Sharks penalty kill improved from 29th at 76.9% to 6th at 85.0% in just one season. The only problem was that the Sharks did not take Andrew Desjardins into their equation. In 2012, Desjardins took over the center role and performed quite well despite taking some undisciplined penalties. Burish simply was a backup plan in case Desjardins didn’t pan out so cramming his contract in with Scott and Brown really is not fair since he was acquired for a purpose. After missing almost the entire 2014 season, Burish is back on the penalty kill, leading all forwards in ice time and taking face-offs on the fourth line. He hasn’t played particularly well, taking poor penalties, but he is hardly to blame for the entirety of the Sharks struggles. Through seventeen games, Adam Burish and John Scott are the only Shark fourth line players with goals. Tye McGinn, Eriah Hayes, Andrew Desjardins, Barclay Goodrow and Chris Tierney are still goal-less. In game eighteen against the Lightning Tyler Kennedy added his first of the season as the Sharks power play expired barely qualifying as a fourth line even strength goal. A better way to give you an idea of the Sharks fourth line production is by comparison across the NHL. The Kings and Blackhawks fourth lines have only produced three goals of their own this season which is the same number as San Jose. So much for the Sharks fourth being tremendously worse than the best teams in the west. fourth lines are designed to fail. About 90% of all fourth line players will finish the season with a negative Corsi, relative Corsi, FenClose, and negative goal differential all while playing under ten minutes per game. These absurd expectations for the Sharks fourth line make absolutely no sense when even the Boston Bruins fourth line cannot out-shoot their opponents. A fourth line will not contribute much offensively, just look at the 2014 playoffs. The San Jose Sharks fourth line scored as many goals as the Chicago Blackhawks fourth line in ten fewer games. That total was three goals. Matt Nieto has already played on three separate lines this season in an attempt to wake up his game. Don’t get me wrong, the fourth line is A problem but it is not THE problem. Small corrections will not lead to major after effects and the fourth line is only a small issue with the Sharks. The real issue San Jose is facing right now is the fact that almost every player is not playing to their potential. Looking up and down the lineup very few players are having good seasons. Couture and Marleau have looked great offensively but are performing poorly in their own zone. Marleau leads all forwards in goals against on the penalty kill despite being SIXTH in ice time. Couture, Marleau and Wingels are tied for second in goals allowed during 5v5 play which takes away for their offensive contributions. Hockey is not just about offense and because these players are not playing well defensively it is costing the Sharks. Speaking of goals against, Matt Nieto leads forwards in goals against during 5v5 play. Someone who is usually praised for his defensive prowess has looked lost the entire season. On top of that he only has one goal on the season which came against the Kings on opening night due to a Jonathan Quick misplay. Not only has Nieto struggled defensively his offensive prowess has evaporated. He recently spent time on the top line with Joe Thornton and Joe Pavelski but he has zero points during 5v5 play to show for it. Even TJ Galiardi was able to get an assist from time to time when he played with Joe Thornton but Nieto has zero points alongside Thornton. Of course both Pavelski and Thornton haven’t exactly been their usual confident selves either. Against Florida they combined for just one shot, the Thonrton goal created by Brent Burns. Currently they are the two best forwards when looking at 5v5 goal differential but it is nothing compared to last season. Many have said that Brent Burns created the space that led to a lot of that offense and that may be true. Still it speaks volumes if those two truly relied on Burns that much, and gives other teams knowledge of how to shut them down in the future. Meanwhile Tomas Hertl has struggled to remain consistent and the entire bottom-six has been one big roller coaster all year-long. Both Jason Demers and Matt Irwin need to elevate their play if the Sharks want to be an elite team in the NHL. If I could describe the Sharks 2014 campaign in one word it would be overachieve. In 2013, Niemi had a Vezina caliber year and even that was barely enough to get them into the playoffs. Going into 2014 I had my doubts that the team would be able to support Niemi offensively since they would be relying on so many new faces. Luckily the Sharks got career performances out of James Sheppard, Tommy Wingels and terrific debuts from Tomas Hertl and Matt Nieto. On top of that, most of the call-ups from Worcester played well throughout the season. Despite having the most injury plagued season since the 2005 lockout and relying on rookies more than any other season since the 2004 season the Sharks managed to succeed. That is overachieving. So far during the 2015 season no player has stepped up his game. None of the rookies or younger players have truly elevated their play from the previous season. Mirco Mueller, Barclay Goodrow, Tye Mcginn, and Chris Tierney have not added anything spectacular. At the same time Tomas Hertl, Matt Nieto, Jason Demers and Matt Irwin have not shown that they are even worth keeping long-term. Irwin is barely able to crack the Sharks lineup due to his high risk mistakes and Demers offense has all but dissipated. If there is a San Jose Shark that strives to make the team better than please stand up. So far James Sheppard, Tyler Kennedy and Tommy Wingels are the only players who have shown some evidence to the contrary but it is so miniscule compared to last season. Who are the San Jose Sharks? I don’t think anyone knows at this point. I’m not sure if the Sharks are a Stanley Cup contender, a borderline playoff team or on the inside track to drafting Connor McDavid. The first month of the season has been that mysterious and I would not be surprised to see the Sharks on either end of the spectrum in June.